Weight-train circuit style: Set up a circuit of multiple weight-training movements with higher reps and lower weight. You should be able to perform an exercise with perfect form for 15 to 25 reps, moving quickly to the next exercise until the circuit is finished. Move through the circuit two to four times. This will help maximize the aerobic effects of weight training and will expend more calories. Cyrus Khambatta was a healthy and active person. He played sports, enjoyed life and consumed the standard American diet. He paid attention to what he ate but never really deprived himself of anything. Then at one point in his early 20s, he noticed his body started doing some strange things. "The first thing I noticed was that my body started to get really tight, my flexibility was starting to fade," he said. "Then I realized that I had no energy during the day. I would fall asleep in the middle of my dinner, literally. I was extremely thirsty all the time, and I was peeing 18 times a day. I also was cramping up all the time. At that point I knew something was wrong." Something was definitely wrong. At the age of 22, Khambatta was diagnosed with Type I diabetes; his pancreas was failing to produce insulin. He was thoroughly shocked and didn't quite know what to do. He began the proper medical treatment, yet he still experienced extreme fatigue and couldn't play soccer or other sports the way he used to. His vision was blurry on occasion. He was just not himself. But he chose not to submit to the disease. Instead, he vowed to find out everything he could about his condition so he could figure out a way to minimize its effects on his body and lifestyle. He studied hour after hour, month after month, used his body as a guinea pig finally to discover that diet and exercise play the most critical role in fighting off the effects of diabetes. Daily cardiovascular activity: Do your cardio at moderate intensity for at least 45 minutes. Consistency is the key . This will help keep your heart and lungs strong and will help with regulating blood sugar. It sounds simple. Watch what you eat and take walks, right? Not quite. Those with diabetes can better fight the disease with a multifaceted fitness program. Khambatta knows this well. He's a personal trainer who recently was accepted to the doctoral program for nutritional biochemistry at the University of California. "It's not enough to just monitor your blood sugar and take your medication, or walk on occasion," he said. "If you want to live a life where you are truly empowered, you must be smarter about how you eat and exercise." It's been a few years since Khambatta learned of his condition. 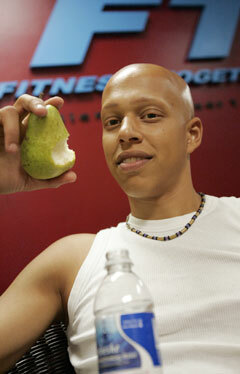 Now he wants to help other diabetics get into the best shape of their lives. Check out his five tips. Stretch and relax: Take at least 15 minutes of downtime during the day or after workouts to stretch and relax. Stress causes your brain to trigger a release of cortisol, the "fight or flight" hormone, causing the release of glycogen (stored sugar in the muscle) into the bloodstream. Breathe deep and make time to relax and de-stress. Play: Make your lifestyle fun in order to get more activity. Jump around more with your kids, wrestle with them, laugh more. Take some dance lessons or dust off some of that old sports equipment. You'll thank yourself. Hyperlow-fat diet: You don't have to be a raw vegan, but you definitely want to keep a close eye on fat grams. Be careful choosing animal products because some can have as much as three times the fat that you need for one portion of protein. Eat lots of fruits and vegetables. A high-fat diet simply causes insulin resistance.